In the moonlit forests of Northampton, Leonardo and Splinter are out for a walk. Leo asks his sensei what exactly “fear” is and Splinter readily responds. Splinter tells Leo that fear is barrier that keeps one from acting; a paralyzing agent. It stagnates the mind and the body and is not easy to overcome. Splinter tells Leo that the only antidotes to fear are courage and action. They are the “weapons” needed to confront the “enemy”. As they return to the farmhouse, Leo believes he understands the lesson and that to overcome his fear of seeing his brothers hurt in battle, he must adjust his attitude and know when to take action. Splinter approves. *Like much of Turtle Soup, the canonicity of this story is questionable in regards to the Mirage series. As it was done by a guest with no involvement from Mirage staffers, it likely isn’t “canon”, but despite that, there’s nothing in “The Purpose of Fear” to contradict the Mirage series, either. So, you know, decide for yourself if it “counts” or not. J.B. Bonivert has a very unique style of art that fans either tend to like or loathe. I’ll admit that I skew closer to the latter, but I think his take on the Turtles are enjoyable in measured doses. And at a scant 4 pages, “The Purpose of Fear” is a very measured dose. Bonivert’s art circa 1991 is more tolerable than his style circa 2001 (when he wrote and drew the Casey Jones graphic novel “Muscle & Faith”), as characters don’t look off-model in every panel and there’s a visual consistency from start to finish. Really, I think my only irk in regards to the art in this whole short strip has to do with Leo’s hilariously thick legs. Those things are like tree trunks, man (kinda reminds me of Skadi, but at least she has an in-story reason as to why her thighs are enormous). On the topic of Splinter, Bonivert writes him a little out of character in this tale, too. He refers to Leonardo as his “young friend”, leaving me to wonder if Bonivert was aware of the family aspect of the Turtles’s relationship with Splinter. 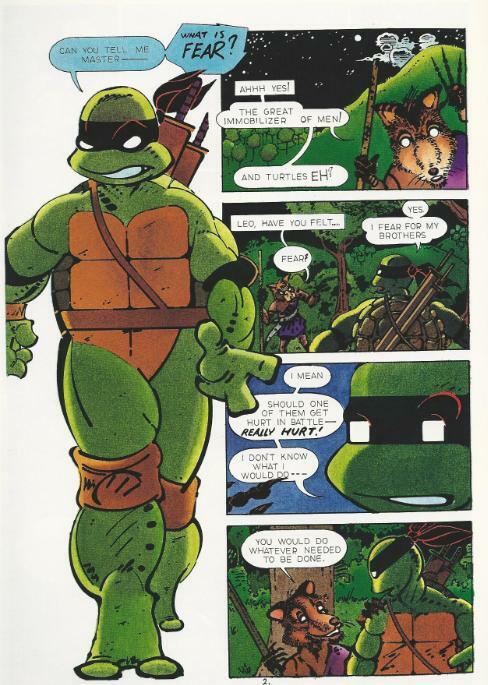 Even more jarring, Splinter calls Leonardo by his nickname, “Leo”, which is something he would never do (kind of like when he called Michelangelo “Mike” in Zulli and Murphy’s story, “O-Deed”). Looking at things from another angle, well, this is a really, really mundane story by TMNT standards. We honestly can’t expect every single conversation between the Turtles and Splinter to be utterly packed with life-changing, thoughtful insight and even the old rat has to phone it in every once and a while. 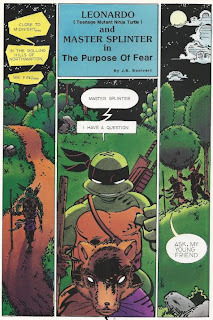 If anything, “The Purpose of Fear” is sort of an honest break from the contrived action adventures and mystical journeys and deeply introspective speeches. Of course, that also kind of makes it boring and tedious, too. I'm pretty sure that Muscle & Faith was at least mostly finished back in 1991-92 and was merely left unreleased until 2000.